Assists in reducing inflammation and pain. Helps to preserve normal joint health & functionality. Reduces muscle damage and pain. 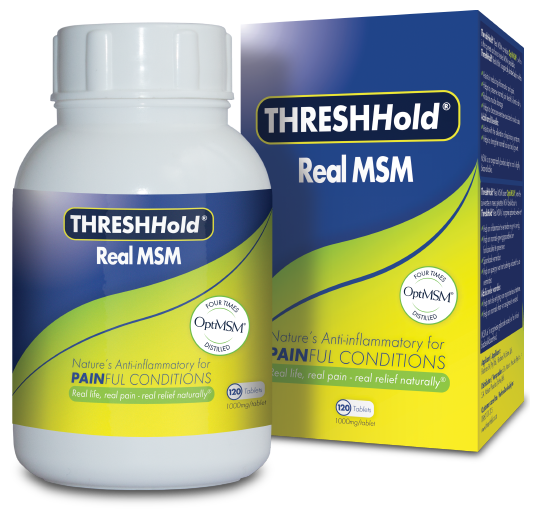 THRESHHold® +Gel contains OptiMSM®, which is the purest and most tested MSM available. This gel is for external use in assisting in temporary relief of pain and difficult mobility of joints in hands, wrists and ankles. Take 2-3 tablets daily with breakfast for maintenance. For chronic pain alleviation a phased approach over two weeks is recommended. Begin with 2 tablets once a day with breakfast for 4 days. On day five increase to 2 tablets twice a day for 4 days*. On day nine increase to 3 tablets twice a day*. Once pain has noticeably improved, the daily dosage of 6 tablets can then be reduced as necessary to reach a maintenance dose of 2 - 3 tablets daily. If required, dosage can safely be further increased without side effects. *Do not take the last dose too close to bedtime. Take 1 tablet daily with breakfast. Take 2 - 3 tablets daily with breakfast. During periods of intensive exercise or training, dosage can be increased to 6 tablets daily (3g twice a day). Apply sparingly to required area and massage gently into the skin 3 times daily.